Currently my work operates in two connected yet distinct realms. The first is the construction of form which I make by hand welding thousands of tiny metal bi-product together. Here my preference is for industrial materials scavenged from regional fabricators to simultaneously ‘show and tell’ a piece of the dislocation of matter. The second realm includes work that is informed by my skills as a public artist and educator and includes more socially and environmentally based projects. These include interventions like, cartas a los árboles muertos (handwritten letters to wooden telephone poles), ‘FantaSé’ (a tourist brochure), and “las cartas huérfanos” (the orphan letters) (an international pen pan exchange) and short films like Agnus Dei and Luddie that reflects on our relationship with nature and issues related to regional diasporas… Ultimately the final goal for all of my artwork really is to expose our real, dense and buried attachments to the ‘other’. …I am related to Ferdinando Selva, a stone cutter who arrived in Albuquerque, New Mexico from Italy in the late 1880’s. My grandfather has told me that Ferdinando came from Tropea in Calabria across from Monasterace. In New Mexican culture the Italian immigrants added a depth to our society in subtle ways and had an enormously positive impact on education. As an organized group, they provided education when the Territorial public school system had not yet been perfected and by providing teachers both of which helped our educational system get started. Since 1880 Albuquerque has been the center of an urban Italian colony which not only grew with the years numerically, but even more so in influence. Those who had groceries, wine shops, and saloons catered to citizens regardless of cultural background. Almost without exception, the new arrivals, if they did not already speak it used Spanish fluently as their native tongue within six months to a year. They learned English, and were often called upon to translate for customers and friends of both cultures. …Here, with both an Hispanic and an American culture, the Italians suffered very little from social visibility, being accepted more readily by either culture than the one culture accepted the other, but acting as mediators in the formation of the unique region that is now New Mexico, the 47th state in the United States. For this residency I would like to bring my two video cameras along with my video and audio editing software to explore this idea that interactions between humans, society and nature are overflowed by many ingredients already in place that come from other times, other spaces and other agents. I especially want to investigate the notion that no place dominates enough to be global and no place is self-contained enough to be local. Ultimately I would like to create an artistic film that renders visible the long chains of humans linking the sites of New Mexico with Southern Italy. 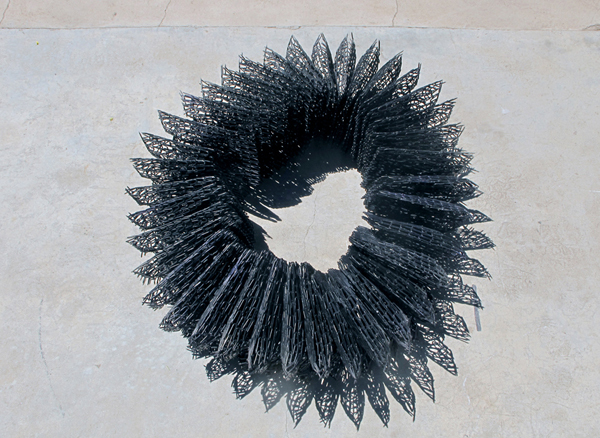 Paula Castillo: “the second part (the network)”, individually welded fencing nails and auto body finish, 52” x 52” x 16”, 2011. 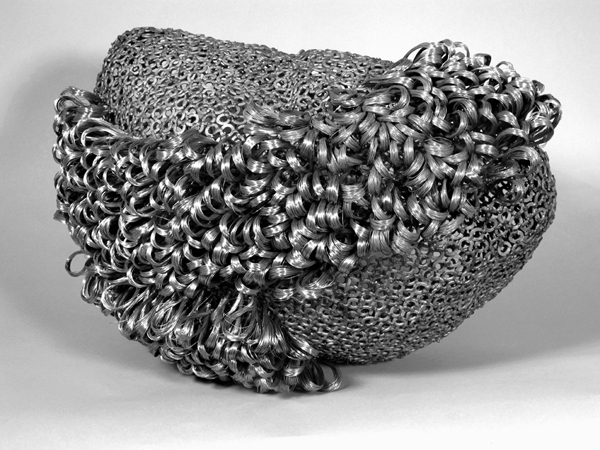 Paula Castillo: “tethered”, individually welded lock washers and hand twisted wire, 18” x 15” x 11”, 2011. 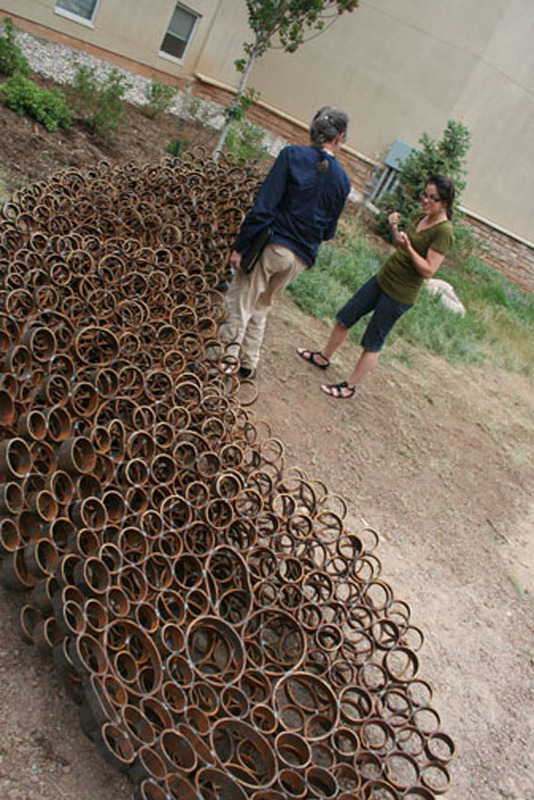 Paula Castillo: “fallen petals”, individually welded corten steel, 4’ x 22’ x 4’, 2010. 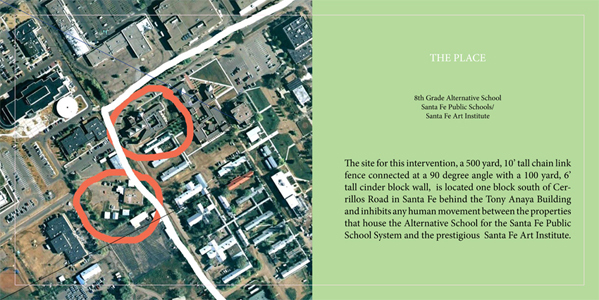 Paula Castillo: “lessons from the fence, relational project - detail.